With revenues from a key portion of the income tax now running $915 million ahead of projections this spring, House Speaker Joe Aresimowicz said Thursday he would support using some of this potential bonanza to preserve “crucial programs” in the next state budget. 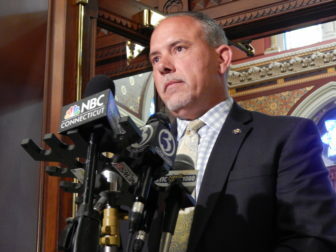 Aresimowicz, D-Berlin said this revenue surge is not an excuse for a “spending spree.” But it could be used to avert a crisis in the state’s transportation program, to aid cities and towns or to reverse cuts to a Medicaid program that otherwise would harm more than 110,000 poor seniors and disabled persons. The speaker also acknowledged Democrats and Republicans on the Appropriations Committee remained deadlocked over how to revise an unbalanced, preliminary budget for the upcoming fiscal year. The committee missed its April 4 deadline to recommend a revised plan, but leaders granted an extension until April 20. Aresimowicz said he doesn’t expect that target date to be met either, adding that instead Republicans and Democrats on the panel are expected to release their respective budget ideas to the public Friday. Unlike in most years since the last recession ended in 2009, state income tax receipts tied to capital gains and other investment income are surging this spring. Revenues from this portion of the state income tax stream came in $665 million ahead of expectations in quarterly payments made in December and January. And final payments received on or about this year’s filing deadline of April 17 — after two days of analysis — are running $250 million ahead of projections, according to the legislature’s nonpartisan Office of Fiscal Analysis. Together that’s a potential bonanza of $915 million. Combined with the $212 million currently in the state’s emergency reserve, that represents more than $1.1 billion potentially available. Those numbers still could change significantly between now and April 30 — when analysts deliver a comprehensive revenue forecast to the General Assembly. Legislators receive daily updates on income tax receipts during the second half of April, and projections sometimes change by more than $100 million in one day alone. More importantly, these receipts are protected legally by a new volatility capping system legislators established last October as part of the new state budget. These unanticipated income tax receipts are supposed to remain in fiscal limbo until September — when the comptroller officially closes the books on the previous fiscal year — at which point they are deposited into the emergency budget reserve, also known as the rainy day fund. The rationale for this new system as that the capital gains portion of the income tax represents one of the most volatile revenue streams in the state budget. Since the income tax was enacted in 1991, this component frequently varies from year to year by double-digit percentages. In other words, Connecticut cannot assume that if revenues in this area surge dramatically this spring they will do so again one year from now. But the legislature still could suspend the volatility cap system, or otherwise stipulate some of these receipts would be withdrawn from the reserves after September to support the 2018-19 state budget. What spending proposals might justify tapping these April receipts? Aresimowicz suggested shoring up the Special Transportation Fund as one example. Gov. Dannel P. Malloy warned Wall Street investors, the business community and the legislature in November that Connecticut’s transportation program is on the brink of a crisis. Absent more funding, the state would need later this year to scrap some rail services, drive up fares, suspend 40 percent of planned capital projects — worth about $4.3 billion in construction activity — including major highway projects such as rebuilding the Hartford viaduct, the administration says. Aresimowicz later expanded the range of spending proposals that might warrant tapping April income tax receipts to cover “crucial programs” that both parties support. Democratic and Republican legislators have urged the Appropriations Committee to reverse a $93 million cut to the Medicare Savings Program. Otherwise analysts say it could eliminate or reduce prescription medication assistance for as many as 113,000 low-income elderly and disabled patients. Both parties also have sought to reduce savings targets Malloy must meet after the budget is in force. That’s because the governor cut more than $90 million from municipal aid this fiscal year to help meet those targets. House Minority Leader Themis Klarides, R-Derby, and Senate Republican leader Len Fasano of North Haven both said Wednesday their caucuses would oppose any effort to spend rather than save income tax receipts tied to the volatility cap. Sen. John Fonfara of Hartford, Senate Democratic chairman of the Finance, Revenue and Bonding Committee, also opposes carving out any exceptions to the volatility cap system.